Travel vaccination service is offered in select Pharmaprix stores and no prescription is required. The Pharmacist and Pharmacy Team are specialists in travel health. 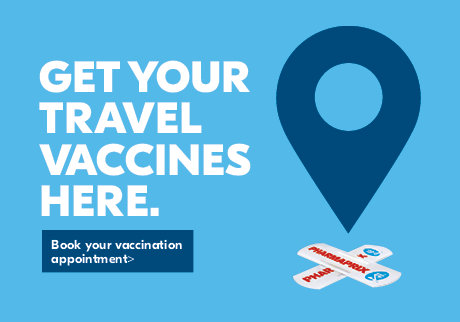 Book your travel vaccination appointment and, depending on your destination, the Pharmacy Team can advise on which vaccines* are required so you can get the ones you need right on the spot. Remember, that even if you have had vaccinations when you've travelled before, you can still benefit from a travel consultation, as the Pharmacist Team will provide you with the latest recommendations to help you stay healthy while travelling!